“I’m busting, Jerry, I’m busting!” The sentiments that George Costanza displayed after finding out that his parents were moving from Queens to Del Boca Vista, Florida are similar to how I, and I’d venture to guess most Bonnies fans, are feeling today. After a rocky start to the calendar year, the St. Bonaventure Bonnies have now rattled off a school record seven consecutive Atlantic 10 Conference wins to improve to 19-6 overall, 9-4 in conference play. They’ve overtaken Davidson for sole possession of second place in the A-10 just in time for an absolutely huge game on Friday night against the 16th-ranked Rhode Island Rams (21-3, 13-0 in conference play). All of SBU’s frustrating losses this season (Niagara, Dayton, St. Joe’s) could be rectified on Friday night. According to Joe Lunardi from ESPN and Jerry Palm of CBSSports, the premier “Bracketologists” if you will, the Bonnies sit firmly as the third team of the “First Four Out” group. A win over a ranked opponent who hasn’t lost a game since December 6th should propel them from “First Four Out” to a firm IN. This certainly feels like the biggest regular season game for St. Bonaventure in as long as I can remember. The fact that ESPN2 is coming to the Reilly Center is a huge coup as well. The Bonnies have a chance to get a statement win on national TV in primetime. All of this hype could be moot if the Bonnies don’t get the kind of production out of Jaylen Adams and Matt Mobley that they got Tuesday night against La Salle, however. Mobley was simply unconscious at times – it seemed like every shot he put up was a guaranteed make. 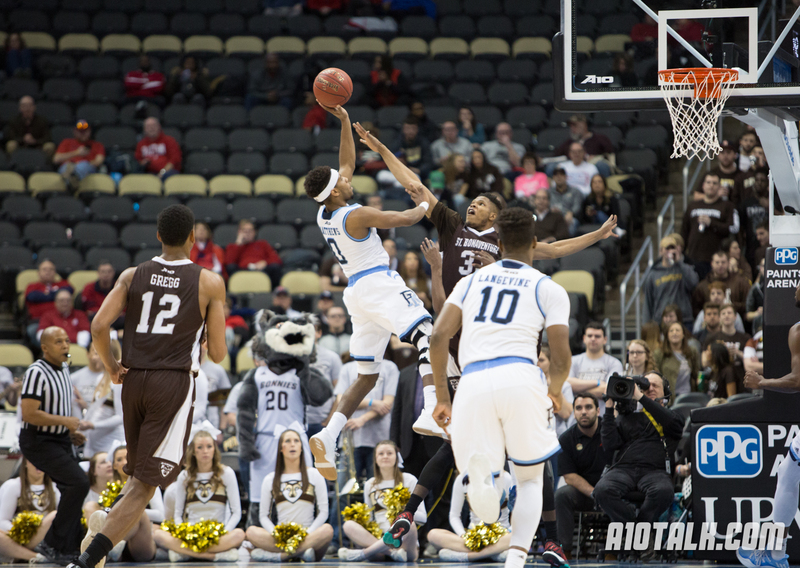 The Bonnies will need to shoot near or at the same clip from three-point range (50%) that they did last night to set the tone and keep pace with a terrific URI offense. Rhode Island has a lot of depth and an obvious front court advantage over SBU as well. The Bonnies’ starters will need to stay out of foul trouble and play major minutes, as usual. I’m thrilled to see LaDarien Griffin back in the lineup because he’s going to be needed in a big way to help contain Cyril Langevine from demolishing SBU on the boards. Courtney Stockard has to step up on both ends of the court, scoring and rebounding, if the Bonnies want to have a shot at the W as well. I expect to see a lot of Idris Taqqee as his defense is going to be essential against the talented group of guards that Rhode Island employs, even potentially without E.C. Matthews who appeared to re-injure his knee in last night’s win over Richmond. The above two paragraphs are what this Bonnies fan is hoping for. But the one without-a-doubt constant that I know St. Bonaventure can count on Friday night is their fans will show up, be loud, and create an atmosphere that Danny Hurley’s crew will want to bolt from as soon as the final buzzer goes off. It’s not every day that the little school in Western New York has ESPN showing up on campus for a primetime game with major March Madness implications. The students are ready. The alumni are chomping at the bit to see a victory bigger than they were ever fortunate enough to witness during their four-year stay in Olean. If Rhode Island is expecting a meager home crowd comparative to the one I saw last night at La Salle, they are sadly mistaken. Kevin Gray is a 2009 graduate of St. Bonaventure University with a B.A. in Journalism/Mass Communications. Currently working at WWE in Stamford, CT as an Associate Producer. Dad to a beautiful baby girl. Huge college basketball fan, specifically St. Bonaventure (and the Big East's Xavier Musketeers).